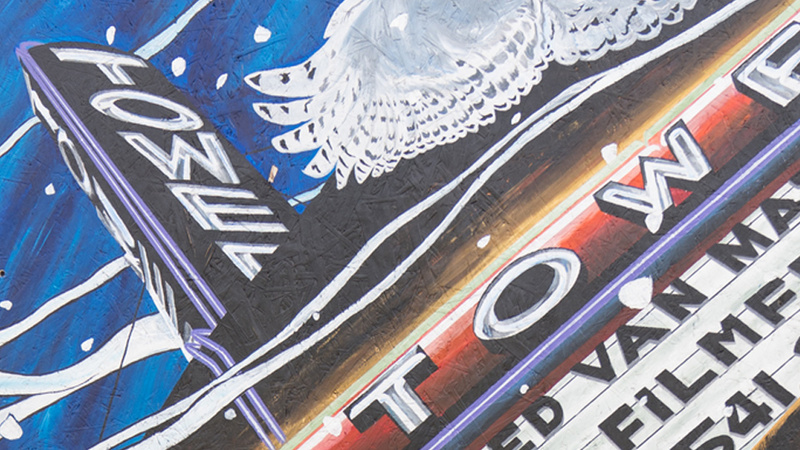 About the piece: This piece was inspired by Bend’s Tower Theatre, which was built by Fred Van Matre in 1940. He was regarded as well-humored and fashioned “good value and honest workmanship” into the structures he built. Much like Van Matre, birds have a playful aspiration to ascend the apex of the sky. They are also innate builders — a constant, universal metaphor for the human soul. About the artist: Avlis Leumas was in love with comic book art since grade school, drawing obsessively through his teens, only to give it up before graduating high school. After a 20 year sabbatical, he rediscovered his love for art in 2012 and now creates vibrant illustrations with markers. He grew up in California, moving to Bend after visiting for the first time with his wife in 2004.